It’s been a long winter, but it appears that spring is finally on the way. Here are a few tips to make sure your pet stays safe as the weather changes and you start getting out more. Avoid mushrooms. Many poisonous mushrooms look like edible mushrooms and can make your pet very ill. Make sure to inspect your yard for mushrooms and watch your pet closely on the trail. Spring cleaning. Keep all cleaners and chemicals far away from pets. Even “all-natural” cleaners contain chemicals that may be harmful to animals. You can visit the ASPCA’s Poisonous Household Products page for more information. Grow your garden with care. Fertilizers, insecticides and herbicides can have ingredients that can make your pet very sick if they’re ingested. Also, many popular spring-blooming plants, such as rhododendron and azalea, are highly toxic to pets—check out this list of poisonous plants to avoid in your home and garden if possible. Know your pet first-aid. More outdoor activity means a greater chance of injury and illness. Put together a simple pet first aid kit, and understand that when in distress, even the most gentle pet might scratch or bite or bite. Handle any injured or sick animal with care, following these emergency handling guidelines. Bee aware. Bees and other insects are on the move in spring and if your pet is stung, you’ll want to know what to do. Look for a stinger and remove if possible. You’ll also want to reduce swelling, which you can do with a paste of baking soda and water. Check with your vet about administering an antihistamine to stave off an allergic reaction. 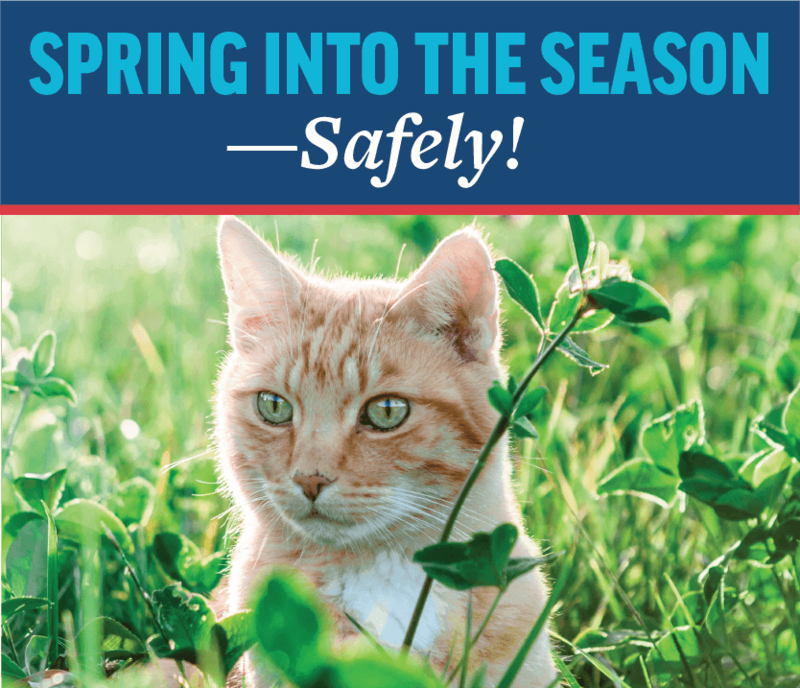 If you have questions about keeping your pet healthy this spring, don’t hesitate to call us at (703) 956-1522.